Bind Mi Band: Bind Mi Band 1.10.0 released! Bind Mi Band 1.10.0 released! We are finally announcing the big release of Bind Mi Band app. And as a bonus: we have added support of Mi Band 1S for all basic features (steps counting, sleep tracking and alarms). 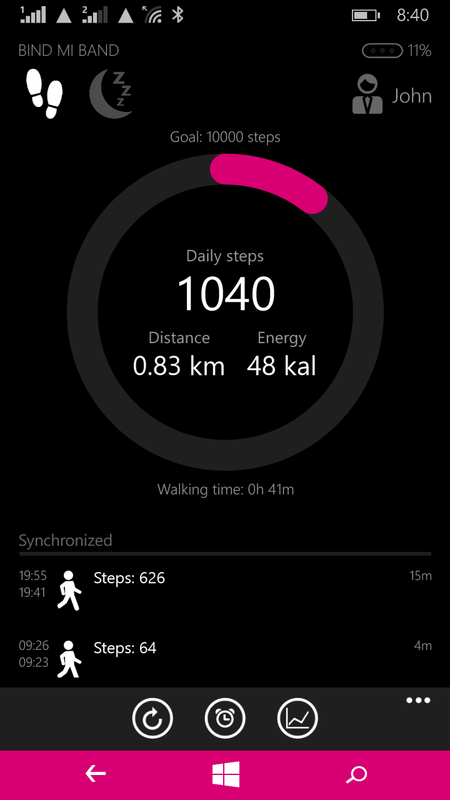 Heart rate features are planned in next release. Before starting using your Mi Band 1S, you need to update band's firmware with an official application Mi Fit for iOS/Android. This functionality is still in test, so, please, report any errors you may see. Excellent update! I have installed it on Nokia 920, works flawlessly. Thank you for this release!! Hello, thanks for great release! Accroding a note in configuration, the notifications for calls and messages are disabled, because Windows API doesn't support notification for 3rd party application. I installed the application on windows 10 (insider preview), and saw the same note. Do you check availability of notifications on windows 10? Where is the documentation for new Windows 10 API? Cannot find any. I believe that since the API is in development phase yet, there is no documentation. Windows 10 Mobile still hasn't released. I just ordered the Mi Band 1S. There is no way to activate the push notifications? good job. This application is increasingly useful. On the Nokia Lumia 530 works without problems. Eventually sure of getting a new band 1S me :) Thank you so much for your application. Can you add the kilometers in the chronology and in the steps list? hi friend, I am very happy with the release of the app to version published, including i'm still testing (Beta Version), the app is great, and I will continue to help so that the app becomes better and better. Excelente work on last update. Awesome update ,thanks for all the additional functions the color accents look really cool. First app bought without any doubts. Is your alarm working well? Hi! The alarms are working yet?? Please, add call- and message notification for windows phone 10! А когда ждать новую версию? Hello! I can not make Mi Band 1S Alarm work. Help! Hello, add weight tracking feature, please. Including diagrams like you already have. And you can make third variant = combine two diagram in one place. Total steps by day and weight. To see correlation and total walked distance and weight loss progress. Would be too interesting and push people to walk more as they know first results. Bought 1s. Updated firmware with android app. Bought your app. Everything works great on windows phone, including alarms. It would be nice to have pulse meter in the next release for 1s. Keep up with the great work! Hi everybody... The app is gr8. I have pro version... I noticed that alarms are not working :-( can somebody write what firmware of 1s is the newest one? I had the same problem. I just borrowed android phone from a friend, installed official android app and upgraded my band to latest version. I think it does it automatically. It solved my alarm issue. I can confirm the issue with alarms can be fixed by firmware upgrade to 4.15.11.20. Підтверджую, що апдейт прошивки до 4.15.11.20 вирішує проблему з будильниками. updated to the lastest firmware via a borrowed android (5.15.11.20) and Sleep Tracking isn't working for me, there is something i'm missing? BTW, alarms are working just fine. Hi, bought your app recently. I really like the simplicity of the interface. Hi, I bought your app a while ago. Keep up the good work. I hope that on wm10 we will be able to get notifications. Is that possible? I wanted to check with you all if your band automatically connects with phone? When I get out of the range, it disconnects and I have to manually connect with phone. I have Lumia 830.
it re-connects fine with my Lumia 950XL. Just bought a lifetime subsciption of the app. I was wondering why doesn't it count the distance? I can see my step count each day, but the distance remains 0.0km. Also, the app syncs quite fast with MiBand, but below the step count it shows loading bar that keeps saying "synchronizing...".